Your satisfaction is our goal, that`s why we manage personally the organisation and performance of your tour, without intermediaries, making your experience singular, personal and wonderful. Enjoy Minorca by boat guided by local and passionate experts, in an astonishing boat where yachting is a real pleasure. Trinidad manages your booking while Diego will be your host at the “Namiyoke”, our last generation boat with all the amenities making your only concern to enjoy the sea, the sun and Minorca´s incredible north coast. Diego, owner and skipper, has a long nautical experience in Minorca´s waters. Anthropologist, scuba diving instructor and passionate on sea and nature, with him you will enjoy a global experience, guided and commentated personally to learn and delight the most genuine and natural Minorca. Trinidad is customer services manager, and Diego´s right hand. She will make sure that your booking get to a good end. Her passion about nature and sports brought her to become a physical education teacher, ski instructor and scuba diver. She will do her max to bring you the best experience, due to her great management abilities and skills to adapt to your plans. 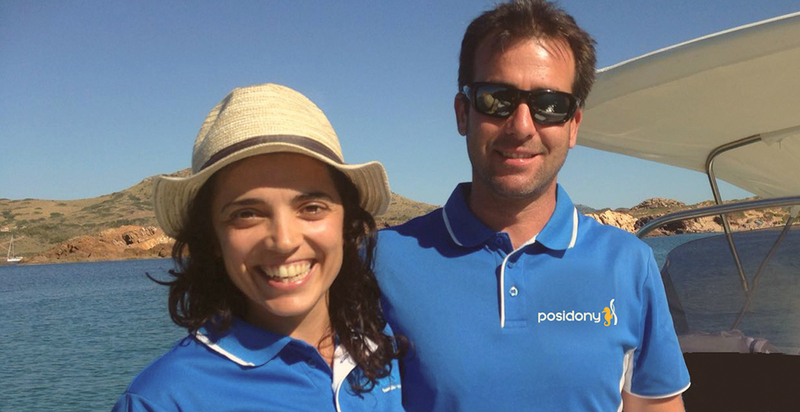 Posidony`s last acquisition is a brand new boat from the famous Beneteau`s shipyards. The chosen model, Flyer 7.7 Spacedeck, has a modern and ergonomic design bringing huge comfort and safety. It is equipped with a cabin that can be used to change the swimsuit or your clothes, WC, two big platforms to easy access to the sea, versatile dinettes at bow and stern that can be transformed into big and comfortable sunbathe areas, fresh water shower and sun roof. Aboard “Namiyoke”, which means “protection against the waves” in Japanese, you will enjoy a pleasant and safe navigation, that added to its great manoeuvrability will take you to remote virgin beaches, caves and spots where no one else arrives.